Choosing the Right Bike and Size. It has never been easier or more affordable to buy your child their first bike, trike, balance bike or scooter, but which one and when? Children are usually ready for some form of mobility from around the time they can walk, whether it's in the form of a ride on toy or a small trike, when they reach the age of 2 they are generally ready for the next step their first bike. 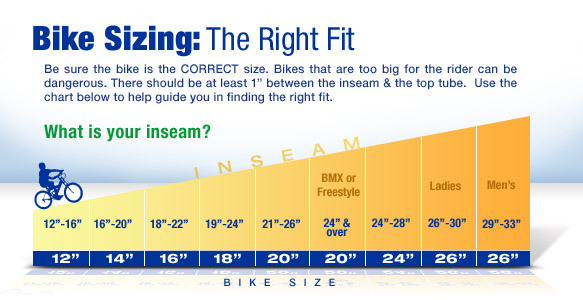 The below chart provides a good insight into sizing requirements to suit your child. As with trikes the choice is limitless with bikes. Of course training wheels will be standard and necessary on children's bikes. Bikes and children are like children and shoes they grow quick and can grow out of their bikes quick so you will see a few bikes come and go along the way to keep up with their growth, with this in mind a bit of thought needs to go into how much you need to spend, what features you really need and are any of these features able to be taken from bike to bike if required. For example let's look at the bikes with parent handles a great "essential" item to have on their first bike why? An essential item you ask, well next time you are down at the local park or beach front observe the parents with their children riding their first bikes, 9 times out of 10 you head out and the child is keen, they go flat out and then they don't want to ride back to the car, then you see mum or dad bike in one hand child in the other , solution Parent handles they allow you to leave them on the bike to steer and you push them back , the child feels like he is riding and enjoys the experience and the parent looks forward to the next day out. OK we have established parent handles are the way to go, now do you buy the bike with one fixed to it or buy the bike and then add a handle like the one available at www.jestomic.com the "Push me Home" is removable, ergonomic, lightweight and transportable from bike to bike, child to child. A fixed handle may suit, but insure to check the height of the bar and ensure it suits you the pusher it has to be good for you as much as it assists the child. The whole idea of adding a parent handle is to aid your back and position you will be in if assisting to push your child along. The Push me Home due to its universal joint suits all heights of pusher allows assistance from behind or alongside. 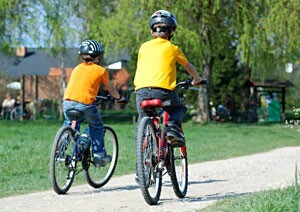 Bikes with steering assistance handles are also available, while they do a great job in the very early stages of your child's bike riding experience the whole idea of cycling is teaching motor skills, coordination and independence so you don't want to impede your child's learning any more than you need to. The parent handle on steering bikes is fixed and not transferable to their next bike or other bikes you may have a need for it. Balance bikes also have their place but research has shown that children that have been on a balance bike take longer to take up and learn the coordination of a normal bike in the authors view an unnecessary and expensive step that can be avoided. 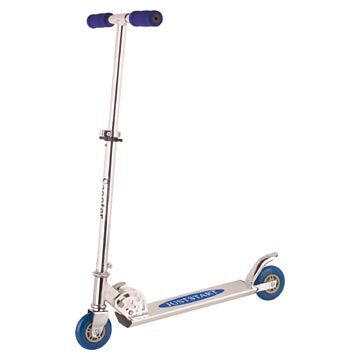 Scoters on the other hand can be a great tool to put in place before or during bike riding to promote coordination and balance. The basic steps to bike riding are pictured below.